new addition to this list HP = Hewlett-Packard. lightweight item Tek = Tektronix. heavyweight item DOM = Date of manufacture. item is currently under offer MOD = Ministry of Defense (British). Reference grade RF oscillator module with GR o/p. 180-600 MHz. Reference grade RF oscillator module with GR o/p. 50 to 250 MHz. 170kHz to 65MHz, AM modulation, sturdy valve/tube. Bound copy of service & user manual available. 10 to 480MHz, AM modulation, sturdy valve/tube. Basic, compact, oriental, 100kHz to 150MHz, harmonics to 450MHz. Good for hobbyists, hams. RF signal generator 10kHz to 72MHz in 6 ranges with large rotating dial scale. Fine tune. AM mod. Extensive features. Max o/p circa 1v EMF, attenuation in 10dB steps down to minus 120dB. DOM circa 1971. Last cal in late 1980s. Very clean condition. Benchtop unit with 'deco' curved case & grab handles. Part of a ref lab gear series originally instigated circa 1947, and just ending their manufacturing lifespan at this time - possibly the highest evolution of the tube/valve RF generator? As above, except mains input sub-panel neatly unplugs, to provide access for powering from batteries or other clean DC. A reference unit, designed ca. 1948, turret-tuned ranges, 15 kHz to 30 MHz in 9 bands, each with individual, 16" wide linear frequency scale. AM mod 1kHz/400Hz. Wide-range attenuator down to <130dB with unusual, linear 16" wide dB scale. Cleaned & restored in 1999. BNC replaces original Marconi coax o/p connector. Offers should reflect the clean, working condition. Circuit diagram available. Generates test impulses with high RF/EMI self-immunity. Used to test RF field levels, receiver noise & EMI reception levels. Plug-in modules cover various HF, VHF & UHF ranges. The units were originally by 'Empire Devices Inc, NY'. Later ones are 'Singer Metrics - Empire Model'. A badge shows units are part of a US Dept of Navy, Sperry contract. The generic model no is 'NF-105'. Tuning units are T-2/NF105X. 2 x 200 to 400MHz. 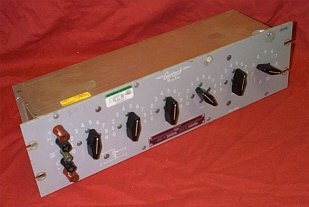 VHF Field Strength meter, US Army type J-95-BM, made by Rauland Corp., 100 to 155MHz. Plug-ins for Tek 5000 series scope & bench mainframes. DM 501 DMM (digital meter) module. Portable, early 60s valve/tube, single channel, 10MHz. Tek 454 100MHz portable dual. Requires repair. Manual available. Collector's item - see Tek collectors' websites. Dawe CT343 - Electronic Voltmeter (sev) FSD 400µV to 400v AC, audio range, valve/tube based. Needle meter remains ideal for monitoring fluctuating situations. Includes final sig output socket, etc. Rack mounted base, fitted in rugged, lightweight military air-cargo grade casing. Clean condition. Made to high standards by Dawe of London, for Royal Navy (UK military specification - Admiralty Department), in 1960s. Ideal for calibration, balancing & nulling operations. General Radio Megohmmeter Reads up to 2000, 000 Megohms (2000 Giga-ohms) 500v and other DC test voltages Rugged portable metal enclosure, case needs slight attention. Portable. Battery powered. Needle reading. Reads down to 1e-14A (femtoamperes) & up to 1e14 (Tera) ohms. Related model until recently still featured in maker's cat at over $800. North Atlantic 214c Phase Angle Voltmeter. Audio band ranges. Null type, needle readout. Idiosyncratic model name for a mid-60s low cost, miniaturised VTVM (actively assisted multimeter) with multiscaled needle readout. Mains powered, direct off line 105 to 130v AC. Volts DC, AC and ohms. DC range FSD is from 0.5v but up to 4kV DC. (few modern DMMs go over 1kV). Needs re-cal. Needle readout, calibrated for rms AC volts and +/- 45 deg phase Valve/Tube. Waterproof, portable casing. Lightweight, 115v powered. Bradley 132 Current calibrator - µA & mA. Bradley 144 precision DC multiplier - increases range of the above, up to 10A. Gertsch RS1224 Resolver Simulators - in portable, rugged casing. Bench-top wideband line-level transformer with 4mm terminals. Balanced in & out. 1:4 ratio. Used with ratio transformers for AC calibration. Likely also a superb line level, audio transformer. Holt Labs - audio voltage standard. Wide ranging AC-V, mV up to 1kV, at audio frequencies. Delta Standards calibrator 015-001 - for Tek 130 LCR meter. IEEE 488 (GPIB) bus. 10mV to 10v. Modern design, compact & lightweight. Tinsley 5644 standard cell pack Multiple (four) Weston type cells, portable, with adjacent management electronics (for temperature control). Made in London in the 1970s. Used for primary voltage calibration. 1980s-manufactured, portable EHT tester, in leather case, with EHT probe and ancillary connector. Up to 10kV, with voltage & current reading and overcurrent trip. Lightweight and compact unit. Audio Spectrum Analyser module - plug-in for Tek 545 (or 545B) - available, see above. 0-20kHz vernier, manual tune or scan, 0 to minus 80dBr attenuator. 10Hz to 50kHz. 300µV to 300v sens. Copy of user & service manual available. Marconi TF 2330A - similar ranges to 302 above. But 1970s, transistor-based. Valve/Tube. Working order. User & service manual available. Dawe CT344 - Audio and Infrasonic Signal Generator (sev) Tunable 0.1Hz to 10kHz in decade ranges. Valve/tube. Rack mount base, in rugged, lightweight military cargo casing. Clean condition. Made by Dawe (London) for Royal Naval use (UK military specification - Admiralty Department) in UK in 1960s. The peak of valve/tube-based audio signal generation. HP 206B sine wave generator Valve/Tube. Copy of user & service manual available. Used to evaluate and accurately determine power ratings of speaker drive units. generally covering 10W to 1kW or more, 4 to 16 nominal impedance. Simply connects between a suitable power amplifier and the driver-under-test. Rack mounting, 2u. Linear output for external metering & logging equipment. Clean condition with manual. Note that this instrument class (in daily use by several top UK speaker manufacturers) rarely appears on the second-hand (surplus) market. Note: If sold, this product can also be bespoke re-manufactured. Old but still special acoustician's test gear, based on the astute concepts of the late Richard Heyser. 2 channel, latest & last production version. Old in PC-land terms, but interface software is on CDR, to run from any modern PC. Full set of manuals and original software on floppies, all in very clean condition. Kelvin & Hughes, Type 10, (chart) recorder amplifier. Valve/tube, late 1950s. C-Audio SR-606 - 2 channel PA amplifier. Sonic upgrading available. HH V800-X - Extra Special version of a classic audio power amp with rated delivery capacity of apx. 450W/ch into 4 ohms. Totally stripped down and rebuilt to high standards by BDR, hence special 'X' designation. Stunning sonic quality, out-performing prettier and vastly more expensive high-end hi-fi amplifiers. Has true balanced inputs, Philips top-grade reservoir caps, extensive RFI/EMI protection, fully restored & enhanced wiring, auto slow/fast fan cooling, and far, far lower %THD and noise than any original HH-made units. Suits anyone requiring top notch listening/auditioning equipment, with serious power delivery and ruggedness. Limited availability, although additional, matched units can be produced to order. Crestron 'Media Control Sys', Cresnet II-MS.
Millbank 'PAC-Sys'- visual monitoring combiner. Kramer VS402- 4x2 matrix switcher, 'vertical interval' type. 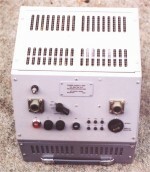 Mini-Comms S70/3 DC PSU - ex UK Royal Air Force (base comms). Output: Switchable 24v, 26v or 28v DC @ 5A. Voltage also trimmable. Short circuit protection. Solid state regulation. Rugged ali casing, grey painted, portable - with 3 handles. Ideal as a 24v battery charger, equipment supply or dedicated 24v lab supply. Also ideal for professional audio setups using vintage NEVE modules external from the mixer frame, where minus 24v (or +24v) is required. Two supplies may also be applied to provide ± 24v, for powering modules taken from several makes of similar vintage high-end mixing consoles (professional mixing boards - notably NEVE). Various DOM, 1966 thro 1977. All in good to excellent condition. Available in quantity. Discount for 10+ pcs. 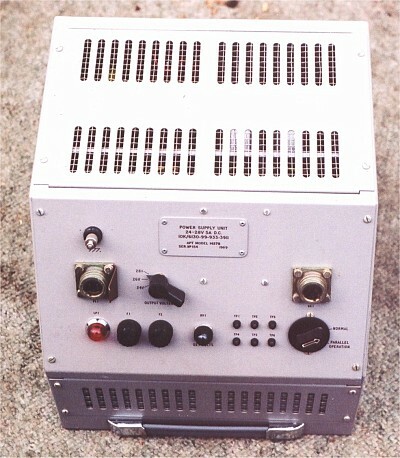 Ex-UK MOD/Royal Air Force, Power Supply Type N (NATO SP-6130-99-109-8970) Heavy-duty, unregulated DC supply, choke smoothed. Designed 1971, DOM 1973. Nom. 36-45v @ 10A . 115 & 240v AC. Variable 0.5A to 10A output current limit via knob. DC o/p Ammeter. O/P cable to terminals & battery clips. For variable (trickle to rapid) charging of 36v battery sets, both lead-acid & NICAD. Restored condition. ex-MOD test gear, 1980s manufacture. Provide clean DC with V/I regulation & abuse protection, in compact enclosures. Various voltages eg. 5v,12v,15v, at 1A to 30A. These are normally intended for incorporation into equipment or other overall casing, but also make excellent ad-hoc supplies for circuit & equipment development. Variacs - 1A, 240V, 50Hz primary, also suits 115v & 60Hz energisation. UK made. Clean condition. Ex-equipment. Powertron Model 160, ITECO (USA, NY) Portable specialist AC mains supply giving 400Hz -2.5%, +2.5% at circa 1kVA. Fine freq adjust by finger-spun dial. External oscillator option enables outputs above 400Hz, to above 5kHz. Derritron TW-1500 1500W, 3000VA industrial power amplifier, capable of delivering an undiminished power into heavy reactive loads of vibrators/shakers, for acoustics research, engine testing, critical systems verification, etc. Also a high power AC supply, with wide ranging frequency & wavetype control. Max output nom 21v rms x 200 Amperes. Rack cabinet, 7 feet high, contains water (vehicle type) cooling system. 3 phase, 50Hz mains input. V & I metering, protective breakers, signal level and type selection - sine or noise. Sine drive frequency can be varied, spanning most of the audio range. About ¼ of the rack space is spare for mounting other instruments. Unit weighs circa 250Kg/550lbs or ¼ tonne. Ex-UK govt research, good condition. Manuals still obtainable from former UK maker. This instrument is of significant value - please make offers accordingly. variable/switchable low & high pass filter set. Made in CA, US, circa 1960s. Portable, passive, 600 ohm in/out. Approx 15Hz to 18kHz cutoff range, both low & high pass. DL 2808 multichannel transient analyser, UK made. Master unit with expanders, Adds multi-channels of transient capture to any oscilloscope. Khron-Hite (USA), wideband DC to 1MHz power amp 10 watts, rugged valve/tube output stage. Various - all Polaroid based, film still available. * special, for image intensification, etc. 3u high free-standing unit with two panel-mounted spindles, and Variac (UK made by Claude Lyons) to control rewind speed. Megger model BR3, wooden box, ca. 1970's. Clean condition, generator cranked from folding handle. Does following 4 test set-ups : Insulation, Varley, Murray Loop, Bridge. LCR Bridge, C.S.I. (made in USA) model 250DA, 1966, rugged, instructions printed inside lid. FSD ranges 100 Henry to 100µH, 100k to 0.1 ohms, 100µF to 100pF, resolves to 1/100th of these via stacked tri-vernier dials. Has valve (tube) det amp and magic eye null meter. Runs on 115v AC. Leeds & Northrup (US made) reference calibration gear - portable in light metal boxes. d.o.m. 1974. Russian remake of 1930s German classic. Leather cased. approx 12kVA, 3 phase 415v primary, 'hexaphase' secondary, 3x 25-0-25v @ 88A. Rectifier stack on heatsink, 50v @ 6 x 88A hexaphase. A highly insulated, electrostatic AC voltmeter, designed for direct contact with hv power lines and 50Hz (or 60Hz) sources up to 10kV, with arc-over protection. Adjustable capacitative attenuator sets 5 or 10kV fsd. Uses primarily for indication, ie to demonstrate safe working conditions. Classic Ferranti design, made in UK, 1950s. Good condition. Offers above £200. Usage Examples: Mining, building collapse rescue, portable film set shops, and recreational canyon- and rock- face sculptors, etc. Ex-British forces, Bosch (German) made. Extremely powerful handheld tools including drilling machines, pumps and (chiselling) hammers (electric version of a pneumatic drill). Include are apx 1m/3foot long drill bits circa ½" (13mm) 1" (25mm) diameter, for laying (explosive) charges in rock or concrete. Kit includes compact circular wood ripping saws. Operation is from 3 phase 208v AC (standard US 3 phase voltage) at 400Hz. The high frequency - standard for special overland operations, in most aircraft, etc - permits a high power to tool-weight ratio. All items only lightly used or unused. Relevant to avant garde architectural and sculptural art projects, special production companies, and charities and agencies concerned with earthquake relief and related war/terrorist relief eg. for gaining access through rockfalls or deranged concrete monoliths. Suitable power sources - either engine-driven generators or from-the-mains converters, are available from military and aircraft equipment recycling and surplus dealers. Small, clock shape, in bolt-down bench-top casing, clock face, ¼" square drive. 0 to 50lb-ins (pound x inches) and 0 to 58 cm-Kg (centimetres x Kilograms). Vero racks, 4u, with cardguides and backplanes, ex-MOD contract test gear. Rack cabinets, 6 feet nominal, aluminium & steel, with castors & front doors, several single, one dual, ex-MOD contract test gear. ...for bass guitar. Un-used. Bespoke. Suits experimenters & builders. Equipment is unpriced - reasonable offers will be considered. If you can back your offer with evidence of the amount being related to the going market value (eg. from one or more websites), that's all to the good. We prefer enquirers to make an initial offer (in USD, UK Pounds or euros - kindly state which) or statement of what they expect to pay, rather than ask "what is the price". To get an idea of a reasonable offer, we respectfully suggest that you use a search engine to visit other sites to see pictures & typical prices of this and similar equipment. On the one hand, pricing is dynamic according to market demand. On the other hand, a main purpose of this page is to find good homes for quality equipment. Therefore, if resident in UK, and you can demonstrate that the item(s) will be used non-commercially, we will supply it at an agreeable price. In addition, purchase of multiple items in one go, will attract substantial extra discount. UK & EU purchasers only - the agreed price will be exclusive of 17.5% VAT. EU purchasers only - where a business, VAT is to be reclaimed locally. Where VAT is charged we will supply an invoice showing the 17.5% VAT. Items are sold as being in 'fair stored condition ex-MOD' and without warranty or having the degree of operation verified, unless specifically agreed. The latter is available but does cost extra. In many instances the equipment has been in use or was calibrated less than 7 years ago. The accepted bid price of the equipment will also (naturally) be higher if it is cleaned, inspected, and where able, tested. These services are available. But please do not request a quote for restoration or operational checking unless you are prepared to pay realistic commercial rates. On the other hand, bear in mind that a unit that may sell for £50 did cost maybe £20,000 in its heyday (in today's money), and so spending perhaps, a few hundred on having it restored or repaired, is relatively cheap - from this perspective. Delivery can be arranged anywhere in the world at cost. Before making enquires with us for a cost of delivery outside of the UK, please make a reasonable local estimate of the weight and hence ballpark cost of shipping from the UK to you. Weights can be guesstimated with experience, read from maker's catalogues and website archives, or (thankfully) obtained from websites of dealers & collectors that deal with classic test gear. Be aware if you are not in the UK (and possibly Eire/Ireland), then shipping/postage will usually exceed the equipment's cost, unless it is a very lightweight item. This is just as true with any other international source, eg. any e-auction. If the realistically envisaged cost of shipping is viable, or if not, if you can engineer a way of ameliorating this (such as a travelling relative or friend who is visiting the UK), then please do proceed with contacting us. Some (not all) of the other items are truly heavy, requiring at least two strong men or lifting aids to move them. Here the most affordable shipping will be by ship. For the lowest overall cost, you might study all the options, including collecting cargo directly from the port, by self or a proxy driver. Collectors are welcome to collect or have relatives or travelling colleagues collect items. Please contact us beforehand - preferably initially more than 30 days in advance, then closer to the time. The seller makes no warranty in any way as to the electrical or other safety of the listed equipment. A wise buyer will always want to make their own inspection, in any event. Purchasers in the UK and EU, and other countries, kindly take heed: All old test equipment, however well made, may no longer meet over zealous modern safety standards. Users are expected to know how to safely re-commission the equipment, as far as possible in the spirit (if not the letter) of national electrical safety rules. Changing principal mains panel components to their modern equivalents is an example of this, viz. no-touch fuseholders, adding sleeves and boots over bare mains terminals, changing to an IEC inlet (readily fitted as a fly lead), changing mains fuses to ceramic HRC models of correct rating (but take care that some UK/Euro/IEC vs. US ratings differ by 200%). Portable Appliance testers (PAT) may be used to help find common and hidden faults, although lab equipment is not a portable appliance and need not be 'PA. tested'. In our considerable experience, high quality industrial & professional electronic & test equipment, as listed here, is electrically ten-times safer than most consumer equipment, and occasional explicit electrical hazards are mainly limited to aged, frayed or split mains cables, and broken exterior fuseholders. UK (240v), Commonwealth (250-220v) and European (230v) purchasers may wish to note that some items may be of UK Royal Navy or US Navy origin, thus set for 115v AC, but most can be changed either externally or internally for 230v operation. Else, a suitable 50 to 250VA auto-TX or buck winding, may be employed. Alternatively, lab and dedicated users may be able to operate from a 115v house supply.